Glenavon player-manager Gary Hamilton believes his side must be at their best to overcome Crusaders in Saturday's Irish Cup semi-final at Windsor Park. "It's going to be tough - the Crues have done really well in cup competitions in recent years," he said. "However, if we show our ability we can cause an upset and it would be nothing more than our players deserve." Ballymena United are firm favourites to see off minnows Queen's University in the other semi-final at the Oval. The Sky Blues last tasted Irish Cup success in 1989 while they lost at the semi-final stage against Linfield four years ago. 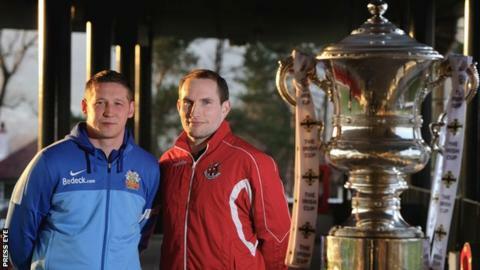 Michael McNamee presents coverage of the Irish Cup semi-finals on Saturday Sportsound from 14:00 BST on Radio Ulster. Crusaders v Glenavon is the feature game with Joel Taggart on commentary along with Roy Walker, who managed both clubs. Scott Young provides half-time analysis. Grant Cameron and Portadown assistant boss Kieran Harding, a former Queen's player, will take you through the action as the students target a shock against Ballymena at the Oval. It's been a fairytale run for the Belfast students, with the Championship Two side reaching the last four after a 3-2 win over Bangor. Glenavon have progressed under Hamilton, a top-six place secured in the Premiership to go with an impressive Irish Cup campaign. They face a Crusaders side desperately seeking silverware after losing the League Cup and Co Antrim Shield deciders in penalty shoot-outs. Stephen Baxter's side has reached the Irish Cup semi-finals stage in five of the last six seasons while Glenavon's last appearance in the final came in 1988. "The players I have at this club have the hunger, desire and passion to win football games," added Hamilton. "It's nice to make the top six and the semi-finals - I know the boys will give it their all and do everything in their power to get to the final. "Considering the finances that we work with, it is an even bigger achievement to be where we are." Crusaders go into the match without injured trio Declan Caddell, Matthew Snoddy and Aidan Watson. Crues goalkeeper Sean O'Neill said the semi-final presents a chance for someone to become a hero. "We have to match them physically and it's a game where you want your big players to show up," he said. "There's tension and nerves but you have to channel that in a good way, to go out and have the game of your life and life and be a hero."